There shouldn’t be an AWP. There should only be one if it would result in me meeting Gina Abelkop. She is the publisher of Birds of Lace, a press that publishes books about girl groups, adventurous twins, and girls who justify murder in high school essays. Most Birds of Lace books fulfill one of the primary attributes of literature: They transmute the reader to magical, mysterious worlds of death, babysitters, and big hair. Gina and I could meet for tea (or vanilla cupcakes). We could discuss trenchant topics, like the veils in Meadham Kirchoff’s Fall 13 collection or Disney princesses. Why, we could even mosey to a Disney store (if there are Disney stores in Boston) and she could purchase an Ariel doll (because she’s a girl) and I could purchase a Buzz Lightyear doll (because I’m a boy). It’d all be rather idyllic. But according to the grapevine Gina won’t be attending this year. So I won’t either, which is fine, since the AWP is as disgusting as gay people, straight people, bisexual people, and Brooklyn. On their site, the AWP claims to be “the largest literary conference in North America.” But the AWP has little relation to literature. Only around one percent of the attendees make literature. There’s just a tiny fraction who formulate texts that are monstrous and divine – that, like those German boys, possess the grit and glamour to wage war on basically everyone on the globe. As for the rest – the 99 percent of AWP people – they are not poets and they are not composing literature. They are not concerned with epic Emily Bronte or moody Frank O’Hara. They are a product of typical middle class capitalism, or, as Karl Marx says, “the bourgeois.” According to Karl, the bourgeois live off others’ labor. They acquire value through accumulation. As the bourgeois stockpile products their worth increases. This renders them reliable upon the proletariat who must toil night and day with very little rest to keep up with the insatiable, indiscriminate bourgeois. With the assistance of Karl, the present “literary” (yes, the quotes are absolutely necessary, so back off, buster) predicament is illuminated. The AWP 99 percent are the bourgeois and the schools – the inordinate number of MFA programs – constitute the labour class. Hardly any of the programs are bestowing insight; rather, they’re enabling bourgeois, and each bourgeois must accumulate products (books) in order to acquire worth (a teaching position). What’s written in these books is neither poetry nor literature: it’s utterly unremarkable. Denise Duhamel’s (Florida International University) irritation with her husband’s habit of falling asleep after a meal doesn’t constitute poetry; Mathew Rohrer’s (NYU) 30th birthday has nothing to do with poetry; Ben Lerner’s (Brooklyn) Spain woes, Aaron Kunin’s (Pomona College) sore throat, Kenneth Goldsmith’s (Buffalo) weather transcripts – none of these (and one could compose a list at least six million times as long as Schindler’s) are poetry or literature. They are a fluctuating mix of labourer-bourgeois ethics. Emily Dickinson says poetry “makes my whole body so cold no fire can warm me.” She feels “physically as if the top of my head were taken off.” The AWP 99 percent would be miserable if something as cinematic as a chopped off head befell them. The bourgeois have to conserve their heads in order to see their products. That term – a generic, indiscriminate, indistinct “product” – accurately describes what’s being pushed at AWP. What’s of consequence is the mere corporeal book (not what’s inside) and the name attached to it — the name that places the corporeal book on a CV to try to acquire employment (although that seems to be rather vexing due to the swell of AWP 99 percenters) and become a bourgeois. The AWP is American economics, not literary. The AWP corresponds to the tasteless USA motto that any one can be anything. Any one who has a bit of money or is down for some debt can enter one of the hundreds of MFA programs and be considered a “poet.” But I refuse to abide by this capitalistic credo. Poetry has nothing to do with equality, fairness, or public opinion. “The Soul selects her own Society,” says Emily D. “Then – shuts the door — / To her divine Majority.” Poetry is exclusive and elite — a one-percent medium. Nearly all the MFA students and teachers aren’t poets. They are, as John Deming inadvertently discovered, bourgeois. They are dutiful middle class workers paying other dutiful middle class workers to evaluate some secondary hobby — trying to make texts that pass as poems or literature. These bourgeois are too tepid and pragmatic to be descendents of poetry. They’re dedicated to the principals of dull democracy, not the ethereal ones that lead to thrilling, theatrical frostiness. Johannes Goransson (one of the few commendably catty boy poets on earth) commits a fair amount of attention to how present configuration of the poetic apparatus. Of top concern for Johannes is the “glut” of poetry. According to two prominent bourgeois – Stephen Burt and Kenny Goldsmith – there is “too much” poetry. Such a situation is sordid because no one is able to read it all, which means no can filter it and say what poetry books are glamorous and what poetry books are gross. But neither Stephen nor Kenny are ones to talk. Stephen has professed his predilection for “unambitious art,” or, what the New York Times calls, “Barack Obama.” Then there’s Kenny. This boy isn’t creating his own society. He’s a gimmick. As Carina Finn says about conceptual poetry – the kind manufactured by Kenny – “it’s sloppy, lazily crafted, hanging all its hopes on the project/concept and paying no heed to the fact that a poem, regardless of its concept, is supposed to be linguistically inventive and formally interesting.” Chelsey’s Poemland is “linguistically inventive and formally interesting.” Kenny’s weather transcript isn’t. Chelsey’s poetry pontificates profound behavior, like cry hustling. Kenny’s product merely poops out the bourgeois lifestyle that he invariably ingests. Neither Kenny nor Stephen are grand. They are members of the AWP 99 percent. Their worth is comprised of bland product, not pointed poetry. But the spew of products that are mislabeled poetry doesn’t bother Johannes. He concurs with Joyelle McSweeney (one of the top three poets presently), who writes of the glut: “You just have to wade through the plague ground of the present, give up and lie down in it, as the floodwaters rise from the reversed drains, sewage-riven, bearing tissue and garbage, the present tense resembles you in all its spumey and spectacolor 3-D.” This is a marvelous, blockbuster description. But it is misleading. The poetry glut is not a Hollywood spectacular. What it is is an overstuffed Brooklyn bar of unenthused, disaffected, levelheaded bourgeois. There are only three Ariana Reines books, three Chelsey Minnis books, and just two Lara Glenum books. These are actual poets, poets shrill enough to warrant Joyelle’s atrocity-esque praise. But 99 percent of the books are by bourgeois like Jorie Graham, Joshua Beckman, Matthew Zapruder, &c. These are the antithesis of monstrous. Actually, there is no actual poetry “glut.” Actually, there’s a poetry famine. Poetry isn’t messy: it’s mitigated. It isn’t even poetry: it’s market exchange. The AWP isn’t a space for literature. It’s an extension of capitalism, another space where products accumulate. “I want the room for a reading to be too loud, too bright,” says Carina. “I want to yell at someone across a table of spilled wine.” I want drama too. 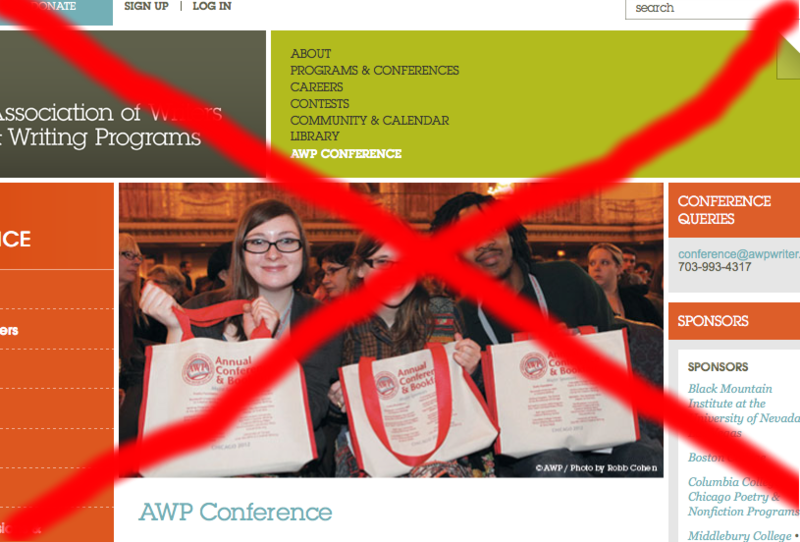 But there isn’t any drama at the AWP. The AWP isn’t the place to cause a commotion; it’s a space for commerce, for what everyone else does in America. The AWP is not related to actual literature or poetry. It is another way in which the common components of the insufferable middle class are reinforced. 99 percent of the attendees don’t have any gift for poetry: they only have (had) money (or a depth of debt). What actually constitutes devotion to poetry proper isn’t traveling to John Kerry Land but staying where you are, making your own world, reading a Chelsey Minnis poem, and maybe watching The Little Mermaid. Neither Chelsey nor Ariel are bourgeois. They are, like poetry’s current one percent, enchanting.